Creed is a lot better than most audience members would expect it to be. Combining new talent in actor Michael B. Jordan and director Ryan Coogler with the venerable Italian Stallion himself Sylvester Stallone to produce a film that honours the original Rocky and yet pulses with a story for today’s world. We first meet Adonis “Donnie” Johnson as a youth serving time in juvenile hall. The offspring of an affair Apollo Creed had shortly before his death in Rocky IV, his mother has also passed on and Mary Anne Creed (Phylicia Rashad), Apollo’s widow, having tracked him down takes him into her home. Adonis as an adult comes from two worlds and does not feel like he belongs in either. He’s made use of the opportunities Mary Anne afforded him to work a white collar job but on his weekends he heads down to Mexico, boxing in underground matches, eager to throw punches at the world. At night he watches Apollo’s old fights and shadow boxes not Apollo’s opponents but the father he never knew. Shut out from his father’s old contacts he goes to Philadelphia to seek out the man who knew his father as a boxer best – Rocky Balboa. Balboa as a boy was told by his father that he didn’t have much of brain so he better learn how to use his body. Here Balboa sizes up Adonis pretty quick and says you sound like you went to school, you don’t have to fight. Yet fighters fight and even though he has to continually prove it Donnie is a fighter. He goes to Mighty Mick’s Boxing Gym and trains while pestering Balboa any chance he gets for coaching tips. In the meantime he meets a girl, Bianca, in the apartment beneath his and they tentatively start a relationship. Played by Tessa Thompson, Bianca has got dreams of her own in the music business and deteriorating hearing that puts a clock on her time to achieve something the way an athlete’s body does on a boxer’s dreams. There are echoes of the original Rocky series throughout, two young lovers relax on a couch and long term fans will remember Rocky and Adrian sitting there while Donnie is now the energetic youth around Rocky the way Rocky once was around Mick. Yet Creed is telling its own story to tell with Donnie and tells it well. The original Rocky was about believing in one’s self enough to take a shot at life. Creed is focussed on a character with a great deal more confidence but still intimidated by the shadow of his father and a world that he wants to enter. By moving Adonis to Philadelphia from his native LA, the film plays up his sense of discovery with the city, love, boxing and himself. Moving at a leisurely pace, equal time is given to the sweet love story and to Adonis learning his profession. Bianca and Donnie’s first date is really about them discussing their hopes for the future and whether the other person will support them or not, appropriate since this film series has at its heart always been about chasing dreams through adversity. There are 3 matches that Adonis takes part in throughout the film, each shot differently and each displaying the growth of the character. The first shows a young man isolated with no support arrogant in relying on his anger to give him the edge. The second is a stand out sequence filmed in one take over multiple rounds with make-up applied in quick turns to the crowd or corners. This is where Adonis finds out if he can be a true professional boxer able to take hard hits and dish them out. Beyond the virtuoso filmmaking on display, Jordan has trained hard and sells himself as a professional athlete in this sequence. Like a boxer in a real ring, there is nowhere for him to hide any weaknesses. The third and final match is shot more conventionally like a HBO telecast as the young Creed takes on a world champion to prove worthy of his father’s legacy. 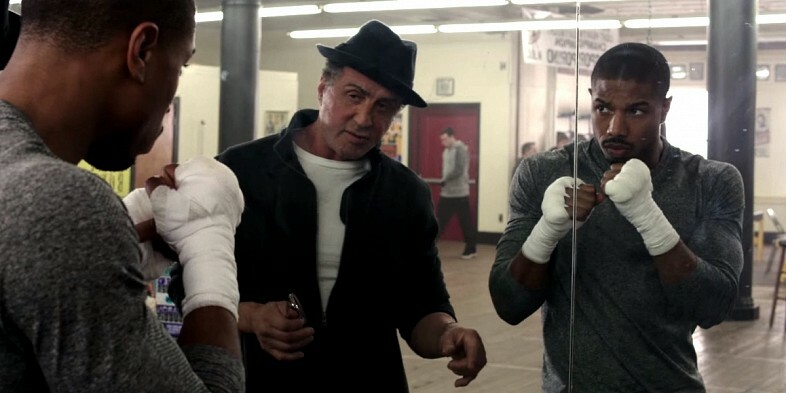 Ryan Coogler co-wrote and directed this film as a love letter to his father who was a huge fan of the Rocky series. The film is sprinkled with lots of references to the past that his father should enjoy, including a very poignant return to the steps of the Philadelphia Art Museum, but Coogler is writing a new story to inspire today’s generation. A young kid who never saw Rocky could watch this film, relate to it and enjoy it without the trappings of nostalgia. Coogler’s own father was going through health issues when he wrote it and this inspired the subplot of Rocky Balboa getting sick with cancer. This sub-plot again gets a lot of emotion out of long term fans but does not require familiarity. The reason is that Sylvester Stallone turns in his best performance since Copland. Now the same age Burgess Meredith was in the original Rocky, it’s interesting to note that after all that plastic surgery Stallone looks like a character actor in this film. As a performer he’s gained himself enormous dignity by admitting Rocky and him finally got old. There’s a small scene where he visits Adrian and Paulie’s graves and talks about ageing in a warm casual manner. In his scenes with Jordan every now and again he smiles recognising himself in Adonis at a different time like a father with a son. Sure he shows the physical deterioration of the cancer but the small choices in his performance make him worthy of an Oscar win let alone nomination. Look carefully at Stallone’s face when Rocky is told his prognosis. Or how he plays the very next scene in the gym. If you think Stallone plays it too obvious you haven’t been paying attention. Rocky Balboa allowed the character to retire with grace and dignity. 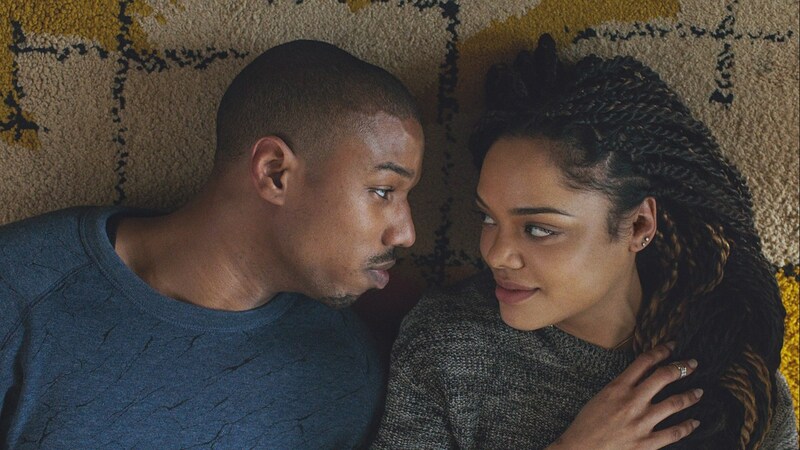 Despite Coogler’s stunning debut Fruitvale Station, Creed sounded like something that could turn out to be a huge mistake. Instead it is something remarkably special, it gives us a delayed sequel to a beloved series that not only adds in quality to those films but can stand apart on its own. This is one of the best films of the year. Malcolm, I’m looking forward to renting this one. I have only heard positive reviews and am glad for Stallone — who knows, maybe beginning his career and ending his career (or a Globe) with the same character would be a stellar trick! Brenda how did you know my nickname was Malcolm? 🙂 In all seriousness Cindy it seems a long shot for Oscar but I would love that. It is quite a line up of actors but maybe he’ll get a Golden Globe. The Foreign Press tend to fawn over movie stars and great news Stallone won the National Board of Review. I hope you enjoy Creed. I still love Rocky more but I really enjoyed this. LOL. Thanks for being a good sport, Lloyd. I will enjoy reading your blog; thanks for the follow!